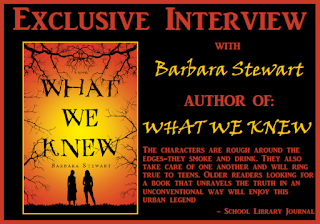 WHAT WE KNEW is the latest novel by Barbara Stewart, and we're thrilled to have here to chat about writing. Barbara, how long or hard was your road to publication? How many books did you write before this one, and how many never got published? My road to publication was a pretty long one—almost sixteen years from the time I started seriously writing until my first novel, THE IN-BETWEEN, was published. I write almost every day, and in that time I wrote a ton of short stories, completed three novels, and started and put aside two more. That’s a lot of pages. But I loved writing every single one of them. Enjoy the process. Despite rejection, don’t stop writing. I know it’s cliché, but it’s true. Sure, there were times when I wanted to quit, just move on and do something else with my life, but I couldn’t. And here’s why. I’m happiest when I am writing. I can’t imagine doing anything else. And I’ll bet some of you reading this feel the same way. So just keep doing it. Here’s my day: I get up, shower and dress, make a beeline for the coffee pot, then sit down at my desk and write. My husband is not allowed to talk to me in the morning. He’s also banned from showing me anything on the Internet. Sometimes he’ll stand in the doorway to my office chuckling about something he’s watching on his iPad, but I ignore him and he eventually wanders off. Three hours and a pot of coffee later, I take a break and do necessary things, like work and clean the litterbox…you know, fun stuff. Before dinner, I head over to my local coffee shop and spend another hour writing in a spiral notebook, brainstorming ideas I’ll flesh out the next morning on my computer. And then my English professor asked if I wanted to write a short story for extra credit. I gave it a shot. And then I wrote another and another…I couldn’t stop. I knew what I wanted to do. I finished my BA in English, married the awesome Dave Kopecek, and moved to the Midwest to get an MFA in Creative Writing. Fast forward through two businesses, a wood-paneled station wagon, a Route 66 pilgrimage, a close call with a tornado, a 1967 Cadillac, a soul-trying move back East, a Shining-like winter in the woods, a run-in with a rabid raccoon, the restoration of an old house, and I still don’t know who I am, but that’s why I write. I’m a kid again; I get to be whoever I want: the tomboy, the rock star, the crazy artist, the drug-sick groupie, the goddess, the suicidal poet. 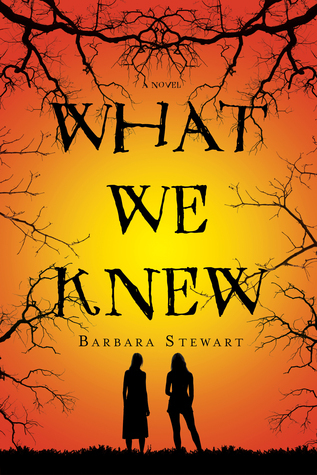 Have you had a chance to read WHAT WE KNEW yet? How inspiring is Barbara Stewart's sixteen year journey to publication? Does writing make you happy?